For your first experience of scuba diving, you can't do better than a Discover Scuba Diving session. You'll learn the basics of using the gear and do one pool session to get comfortable before heading out for your dive. At the end of your Discover Scuba Diving trip, you'll earn a PADI certification and can use the credits towards your scuba course, if you decide to pursue it. This scuba package in Bali is unique because it offers you two dives in Padang Bai, instead of one. NOTE: This Discover Scuba Diving trip in Bali can be undertaken by non-swimmers as well. Bali is one of the best destinations in the world for scuba diving. You'll be diving in tropical water, with good visibility and warm sunny days, making this a perfect scuba experience for a first-timer. Padang Bai is a small port located in the southeastern corner of Bali, about 45 minutes by car from the dive centre. It has a number of great dive sites, but is considered suitable for beginner divers and snorkelling. The waters of Padang Bai are home to gorgeous coral reefs, an array of exotic marine life, sea horses, the harmless white tip shark, and in the right season, even the fabulous Mola Mola. • Earn your PADI Discover Scuba Diver certificate in the teal blue waters of Bali. • Learn the skills required to use your own scuba diving gear. • Discover not one, but two dive sites in Padang Bai. • Witness the gorgeous marine life of Bali on a fun day of diving. You must respect the natural habitat during the scuba diving in Bali. Participants will have to sign an indemnity form before starting the Discover Scuba Diving in Bali. If cancellation is made 7 days or more before the departure of the Discover Scuba Diving trip in Bali: Full refund, minus any transaction charges. If cancellation is made between 0-7 days before the departure of the Discover Scuba Diving in Bali: No refund. The operator reserves the right to cancel, alter or reschedule the itinerary of the scuba diving in Bali due to unforseen circumstances such as earthquake, tsunami, flood, storm, hurricane or any other natural disaster, war, political unrest and other hostilities that declare it unsafe, perilous or impracticable. Participants are responsible for their own belongings and the operator will not be responsible for any loss or damage during the scuba diving in Bali. The operator is not responsible for any injury, accident or death during the Bali scuba diving sesson or sea transfers. You'll be picked up from your hotel in Sanur for this Bali diving trip. If you're not staying at Sanur, you'll have to make your own arrangements to the dive centre or you can pay an additional amount for transfers arranged by the operator. All hotels in Sanur area. Your pick-up should be arriving by about 07:00 hrs in the morning, so do make sure you eat breakfast before that. You'll be driven to the dive centre in Sanur and should arrive by 07:40 hrs. You'll learn the basics of scuba diving and try the equipment in a short pool session before heading out for a dive in the open water. Enjoy 2 dives in the tropical waters of Bali and experience the rich marine life of Padang Bai. You'll have a private instructor who will guide you through your dives to make sure you have a great time underwater. 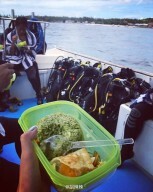 You'll eat lunch between dives, and will be provided with snacks and drinking water. You'll be back at the dive centre by about 16:00 hrs and can collect your DSD certificate. Your scuba diving trip in Bali ends here. You'll be picked up from your hotel in Sanur for this Bali scuba diving trip. If you're not staying at Sanur, you'll have to make your own arrangements to get to the dive centre. Your operator will arrange your transport to the start point of the scuba diving in Padang Bai.